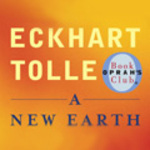 In case you haven't heard, Oprah has picked Eckhart Tolle's new book, A New Earth: Awakening to Your Life's Purpose, as her latest book club selection. She is also doing an online course with Tolle, starting March 3. This course is free and, so far, over 100,000 people have signed up. What is the book about? Well, I have to admit that I've only just begun to read it--I'm on page 54. What the cover says is that this is an expansion of the ideas in his book, The Power of Now, which I read and found to be very inspirational. According to the back cover, A New Earth is about "transcending our ego-based state of consciousness" to help us find personal happiness but also to help end conflict and suffering throughout the world.